That fourth pallium pilgrimage from Canada? It's a go. Within the hour, as the papal plane touched down at Fiumicino, Pope Benedict named Archbishop Terrence Prendergast of Halifax as archbishop of Ottawa. The 63 year-old Jesuit succeeds Archbishop Marcel Gervais, who reached the mandatory retirement age last September. A native of Montreal who's kept his loyalties to the hometown Canadiens, the prelate universally known as "Terry" was ordained for the Society of Jesus in 1972. 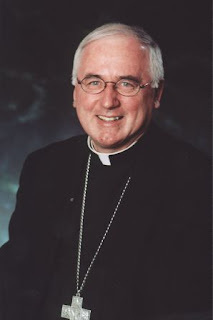 The holder of two doctorates in theology, as with other top-level B16 appointees to date he spent most of his priesthood in the classroom before his 1995 appointment as auxiliary bishop of Toronto. Named to Halifax in 1998, he's been doing double-duty for the last five years as apostolic administrator of Yarmouth on Nova Scotia's southern tip. Prendergast's decade in the Maritimes has provided a re-energizing catalyst to its local church, even in the midst of parish closings and consolidations. In recent years, the archdiocese has hosted Atlantic Canada's incarnation of the wildly-popular Steubenville weekends for young people, and the appointment-day release from Halifax cites, among other particular initiatives, the archbishop's advocacy of the church's teachings on marriage and family life and a renewed appreciation for sacramental confession. With this morning's appointment, the engaged, unpretentious theologian heads to Canada's capital, the seat of a polity which has attracted an outcry from no less than the Pope himself. In his ad limina address to the Ontario bishops last fall, Benedict said that while the Great White North "has a well-earned reputation for a generous and practical commitment to justice and peace, and there is an enticing sense of vibrancy and opportunity in your multicultural cities," he warned that "certain values detached from their moral roots and full significance found in Christ have evolved [there] in the most disturbing of ways. "In the name of 'tolerance' your country has had to endure the folly of the redefinition of spouse, and in the name of 'freedom of choice' it is confronted with the daily destruction of unborn children," the pontiff said, in a speech which was unusually recorded and later broadcast on Vatican Radio, seemingly as an added emphasis on Benedict's remarks. In that light, in a 2004 lecture on the lay vocation and Catholics in political life, Prendergast held up the late Quebecois officeholder Claude Ryan as an exemplar of the faithful Catholic in the secular sphere. In his life, the archbishop noted, "Ryan argued that it is absurd, even deceitful, to maintain that politics can be free from moral principles." "Democratic politics should not, must not, be divorced from serious moral debate," Prendergast said, quoting the politician's belief that "the best way to prevent this ever-present danger is to encourage people who believe in the essentials of moral values in human life to be present in the very places where political decisions are made." Suffice it to say, it should all make for some interesting watching. Prendergast will take possession of his new charge sometime in July.